An 18th Century document that led to the "father of the American revolution" crossing the Atlantic will go on show in Lewes, Sussex, in June. 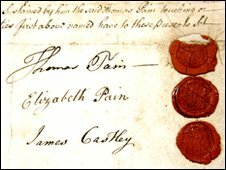 The document is a separation agreement that ended Thomas Paine's marriage to his landlord's daughter when the revolutionary thinker lived in Lewes. Senior archivist at East Sussex Record Office Christopher Whittick said it propelled Paine on to the world stage. He said the £45 separation deal would have paid for his passage to the US. Mr Whittick said Paine spent only a short time in Lewes but those six years were a crucial element in the development of his political outlook. Then in 1774, Paine's business failed, he lost his job, and his marriage broke up. The separation agreement, in which he released any claim on his wife's property, was signed on 4 June that year. Mr Whittick said: "A few months later, Paine was in America, his passage no doubt paid for by the £45 he received from the deal. "In a very real sense, this is the piece of paper which propelled a voluble and eloquent English exciseman on to a world stage." Mr Whittick said Paine's writings were still used in the political arena - and were recently quoted by President Barack Obama in his inaugural address. The document was discovered 30 years ago in the basement of a shop in Hastings. It had been folded into a copy of a novel by the 18th Century author Tobias Smollett, and went on to be framed and hung on the owner's wall. When it emerged that the document was to be sold at auction, Mr Whittick began raising the £13,420 that was needed from grants and donations so the record office could buy it. Mr Whittick said next year's event was still in the planning stage but it was hoped the exhibition would start at Lewes Town Hall on 4 June 2010 - the anniversary of Paine signing the agreement. Before then, people can view it at the record office.